An artist known for his somewhat controversial paintings is taking direct aim at the National Rifle Association for what he called their refusal to “admit their share of responsibility” following the massacre of 20 children and six teachers at Sandy Hook Elementary School last month. The provocative painter Michael D’Antuono, like many artists, wants people to look at his work and think. But he doesn’t just want them to tilt their head sideways and ponder his use of light. He chooses controversial topics and scenes ultimately wants people to engage in discussion that could lead to change. 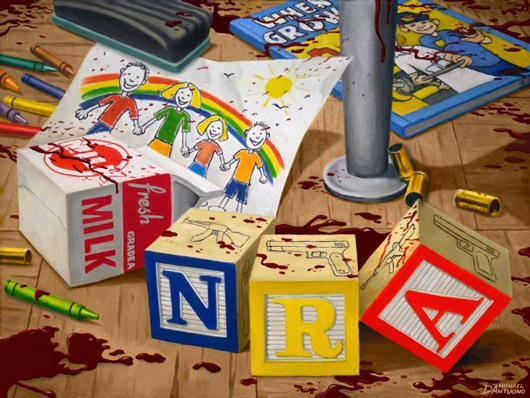 And his latest painting is sure to cause some discussions — perhaps heated ones.The piece titled “Brought to You by the NRA” shows the wood floor of a classroom. Among scattered crayons lies a chalkboard eraser, a children’s career book, a carton of milk, a hand-drawn family portrait and playing blocks. 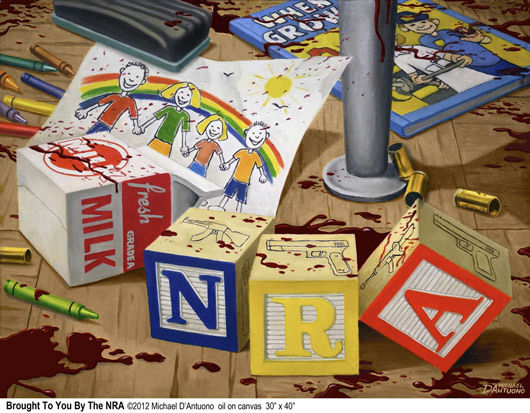 Only those blocks spell out “NRA” and have gun sketches on their surfaces and bullet shells and blood splashes mar the scene.